A few weeks ago I read reading Glenn Crytzer’s blog post about being bombarded with music in which one of the things he mentions is a challenge for instructors to hire a pianist to play for their lessons. 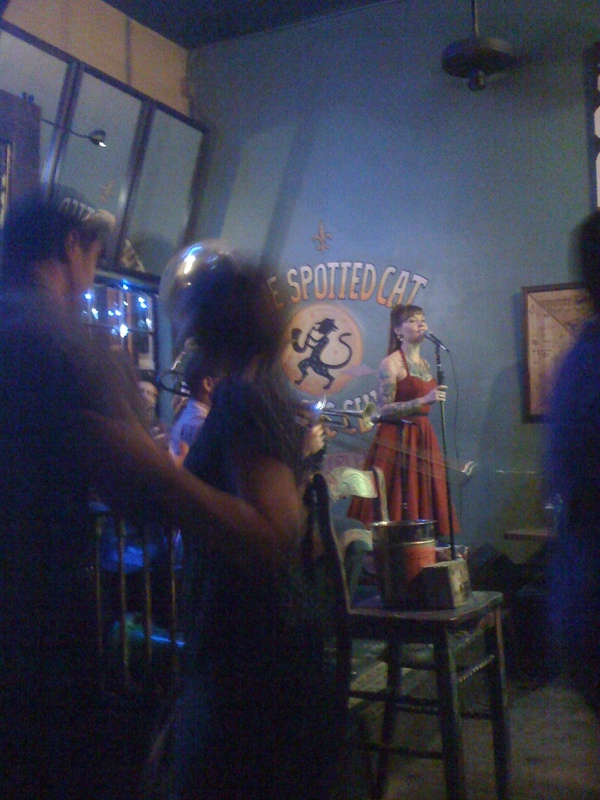 Lo and behold two days ago I walked into The Spotted Cat in New Orleans to find Giselle Anguizola teaching a beginner swing dance lesson with Brett Richardson on Piano and Paul Tenderloin on Washtub Bass playing music for her students to practice to. One thing I found interesting is half-way through the class they took a break to grab a drink from the bar or practice what they learned to live music. For a newbie lesson this is great because it lets them socialize with other students and apply what they learned in a realistic environment. Dancing at The Spotted Cat to Meschiya Lake and Her Little Big Horns. Adds energy to the class and makes students excited. Great marketing tool. Intro swing dance class with live music, sounds a bit more enticing then just intro swing dance class. For instructors it can be difficult to give feedback because you are essentially trying to talk over an instrument/instruments several feet away. For most dance instructors hiring musicians consistently for lessons is not an affordable expense. If you have taken one of these type of lessons at The Spotted Cat or perhaps have taught/taken lessons with live music, please post in the comment section about it. This entry was posted on March 9, 2012 by Apache. It was filed under Running a Scene, Teaching and was tagged with Brett Richardson, Giselle Anguizola, Lindy Hop, New Orleans, The Spotted Cat.